There are a lot of extra columns in default contact lists, and many of them never get used. For Example, by default First Name, Last Name, and Full Name are three different fields. Most people skip entering the Full Name field to avoid the double data entry. A simple formula in a new calculated field can create a full name and prevent the double entry. First, you’ll need to delete the default Full Name column so that you can recreate it with a calculated column type. Go to list settings. Click on the Full Name column, and then click the delete button. 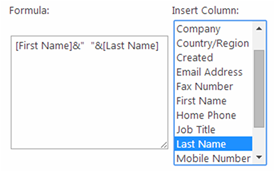 Then, create a new column by clicking “Create Column” on the List Setting Page. Name the column “Full Name” and choose “Calculated” for column type. Use the formula [First Name]&” “&[Last Name] and click OK. The Full name field will now be automatically filled in.